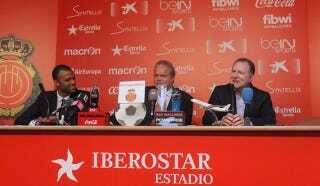 Phoenix Suns owner and amateur intergenerational psychologist Robert Sarver has purchased a controlling stake in Mallorca, a Spanish soccer club currently playing in the country’s second division. The move is presumably good for Sarver and the rest of his ownership group, which includes noted soccer obsessive and former Sun Steve Nash, as it’ll allow them to actualize their Football Manager dreams in real life; it’s almost certainly good for Mallorca, who not too long ago were La Liga regulars and could blossom under the careful guidance and injection of cash their rich new owners have promised; but it’s a pretty telling rebuke of the game in America, as it instantiates the concerns of those of us who aren’t content with the safe and stunted status quo to which U.S. Soccer has resigned the sport over here. The Suns Are A Wreck, And The Owner Is Blaming "Millennial Culture"
American investors purchasing soccer teams in Europe is nothing new. A number of clubs on the soccer-mad continent—ranging from large and storied ones like Arsenal, Liverpool, and Roma, to ones outside the big-league spotlight like Le Havre, Hammarby, and Millwall—already have American owners. Sarver and co.’s selection of Mallorca fits right along with this growing trend. The interesting thing, from a soccer-in-America perspective, is that all these wealthy Americans going overseas to scratch their soccer itch rather than staying home reflects on the specific business and competitive incentives of how the sport is set up in this country. Sarver probably feels he’s closer to owning a profitable, world-class soccer team by buying second-tier-dwelling Mallorca than if he would’ve bought any team in America. He’s probably right, too, seeing how rich owners took clubs like Manchester City and Monaco from relative obscurity to the very apex of the game in only a handful of years. This isn’t possible in America for a number of reasons. For one, the strict salary cap of America’s top division, MLS, prevents any team from spending what it would take to assemble a world-elite club. And with access to teams in the top league jealously guarded (though MLS does promise somewhat alarming expansion, for questionable reasons and by suspect means), the only real avenue for a potential owner to reach the top is to join a tightly regulated cabal that has already proven itself an enemy to the high-risk, high-reward environment all the world’s great teams have emerged from. This is a point repeatedly made by Twitter’s most fervent advocate for systemic change in the American soccer setup, Ted Westervelt, and the other American promotion and relegation supporters. The absence of a real soccer pyramid built on the pure competition that is promotion and relegation directly inhibits real, possibly revolutionary growth in soccer here. There’s no way of knowing if Sarver would’ve looked at, say, a club mired in our second tier, seen the promise of promotion to the top division with monetary investment and smart business practices, and decided to spend his money trying to build that club up from nothing into something. But with America’s closed system as enforced by U.S. Soccer and the colluded, risk-averse rules of MLS, the option is entirely precluded in the first place. Those who oppose the only model known to produce elite soccer clubs and are perfectly fine with the mediocrity of American soccer often retort, when faced with arguments like this, that American businessmen would never invest in a team with the possibility of relegation. As if billionaires are naturally afraid of risk. As if this has ever been an issue in much less capitalist nations than ours. As if a bunch of Americans like Sarver aren’t constantly proving with their wallets that this is blatantly not true. No, what these people—usually MLS fanboys—really mean is that MLS owners will not willingly give up the promise of perpetual safety and hard-cost floors and ceilings and revenue sharing and lucrative expansion fees for the threat and potential of an open market. Which, sure, that’s understandable for them, but who cares? Does your concern about rich people’s bank accounts prevent you from calling for obviously beneficial policies in all walks of life, or only in the league your local soccer team plays in? And why should U.S. Soccer—the body with the power to effect these changes and at least ostensibly enforce the mission statement of improving the quality of the sport and its players—give a damn if making soccer better in the long run means angering a couple dozen club owners? As Sarver and those like him have proven over the years, there are more than enough rich people out there to replace those who are too afraid to take American soccer to the highest level.